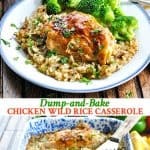 It doesn't get much easier than this Dump-and-Bake Chicken Wild Rice Casserole, which bakes in one dish with just 10 minutes of prep! 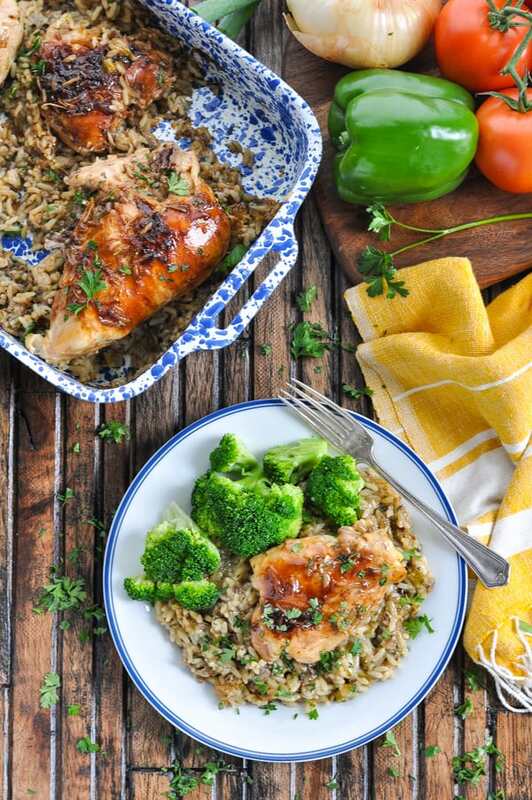 It doesn’t get much easier than this Dump-and-Bake Chicken Wild Rice Casserole, which bakes in one dish with just 10 minutes of prep! 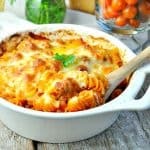 It’s a simple and healthy dinner recipe that the whole family will love! This is total comfort food, my friends! 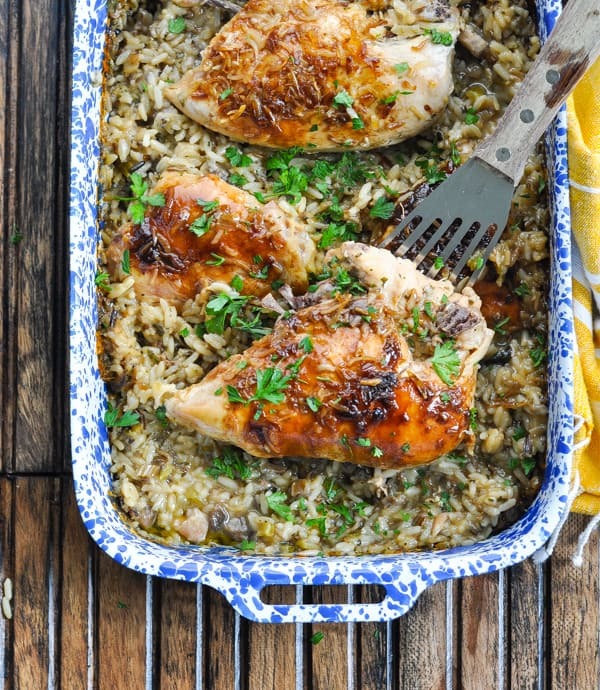 Nothing warms you up and makes you feel cozier than baked chicken and wild rice. 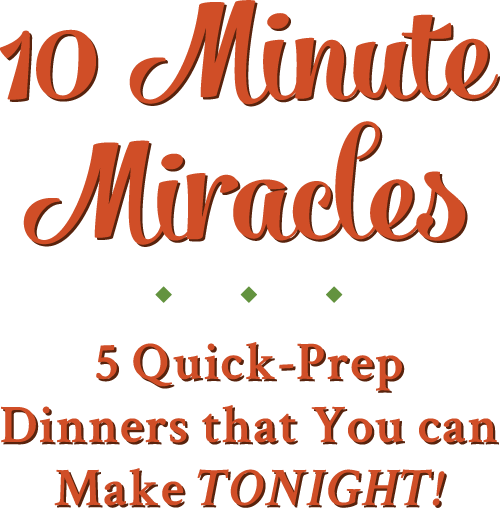 Spend just a few minutes stirring this easy dinner together, and your house will smell amazing, your body will feel nourished, and your stress will disappear (I hope)! 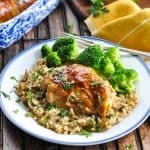 I use bone-in chicken breast, but remove the skin to keep the chicken and wild rice casserole healthy. The bone-in meat has a longer cooking time than boneless chicken, which means that the meat cooks perfectly and stays nice and juicy while the rice finishes baking.You don’t have to worry about your chicken drying out or becoming tough while you wait for the rice to become tender. 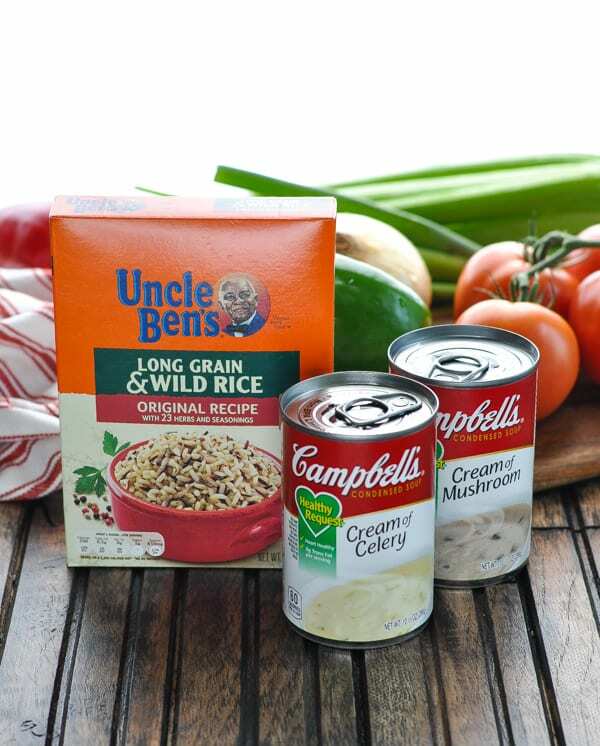 To keep the chicken wild rice casserole healthy, I also like to use the Campbell’s Healthy Request line of soups. Many stores carry gluten-free and organic condensed soups as well, if you prefer. 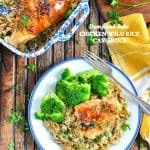 This chicken wild rice casserole is EASY!!! It’s truly a dump-and-bake meal, so don’t peek and pull back the foil while it’s baking. You want to keep all of that moisture in the dish! In addition to your bone-in chicken pieces, you’ll need a box of Uncle Ben’s Long Grain & Wild Rice, Campbell’s Healthy Request Cream of Mushroom and Cream of Celery soups, water, bone-in chicken pieces, and Lipton Onion Soup seasoning (just the dry packet). 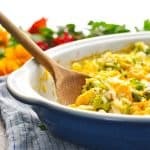 This dish is PACKED with flavor! 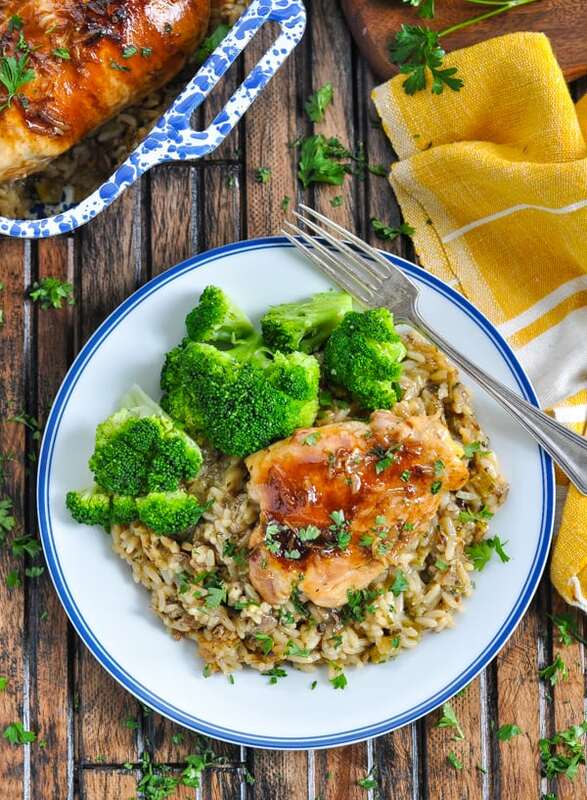 In your baking dish (or in a separate bowl), whisk together uncooked wild rice (as well as the seasoning packet that’s included in the box), the condensed soups, and the water. 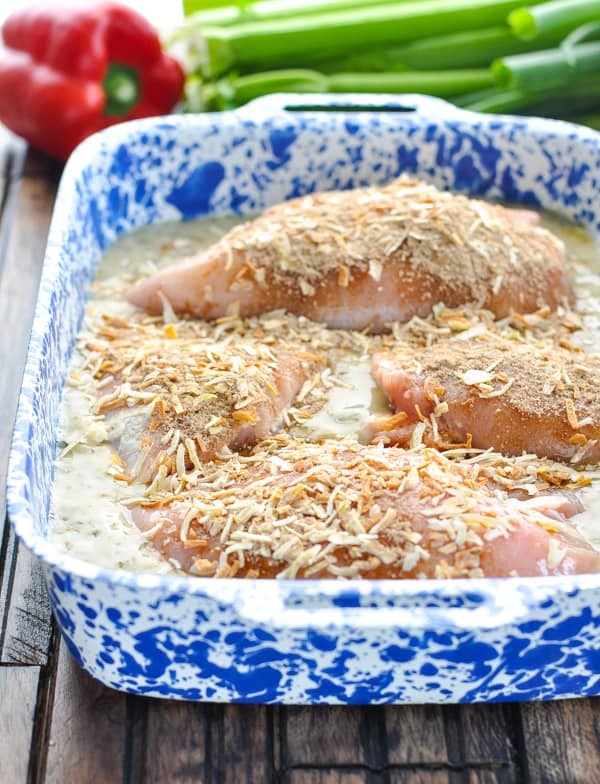 Remove the skin from your chicken pieces and place them in the dish on top of the rice mixture. 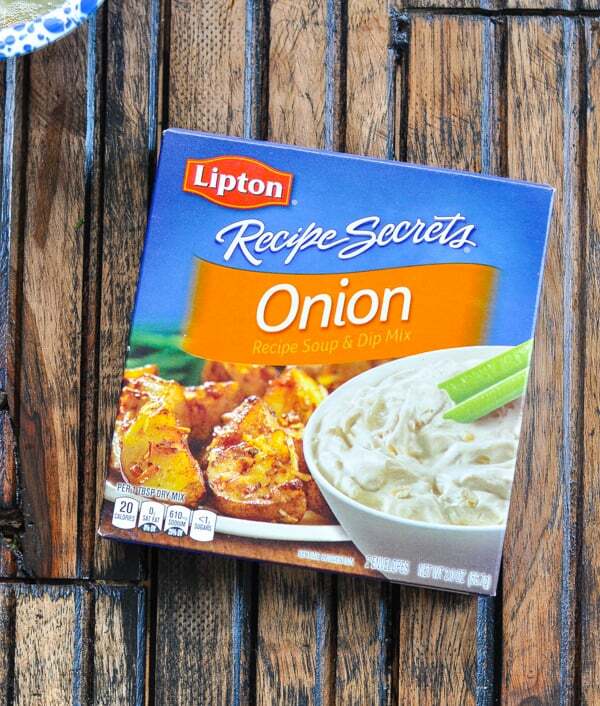 To season the chicken, simply sprinkle a packet of Lipton Onion Soup mix over the meat. You don’t need to prepare the actual soup — just use the dry seasoning in the packet! Cover the dish very tightly with foil (so that none of the moisture can escape), and bake the casserole at 350 degrees F for at least 90 minutes (or up to 2 hours). The total cooking time will depend on the size of the meat that you’re using. I baked these very large chicken breasts and thighs for the full 2 hours and they turned out perfectly! You want the chicken meat to reach an internal temperature of 165 degrees F. That’s how you know it’s done! My meat thermometer is my best friend in the kitchen — just make sure that the thermometer is not touching the chicken bone when you check the temp. Preheat oven to 350 degrees F. Spray a 9 x 13-inch baking dish with cooking spray. 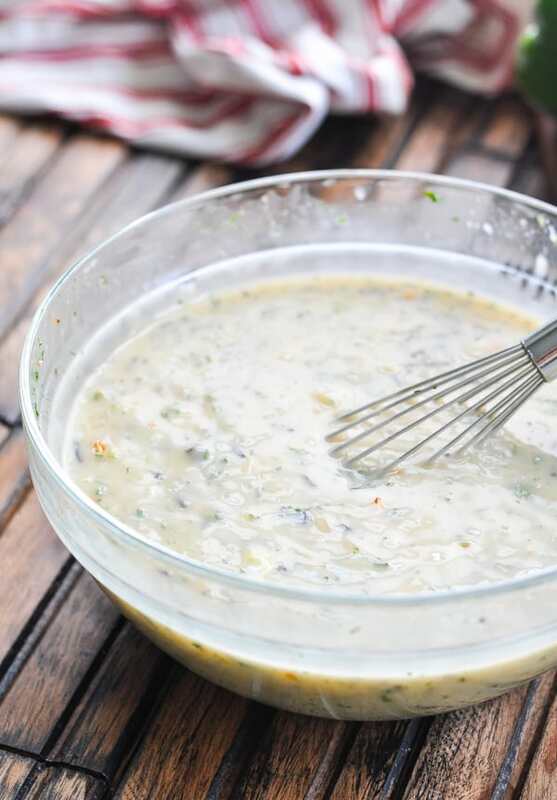 In the prepared baking dish (or in a separate bowl), whisk together uncooked rice (and the seasoning from the box), cream of mushroom soup, cream of celery soup, and water. Place raw chicken (skin removed) on top of rice mixture. Sprinkle the onion soup mix over the chicken. 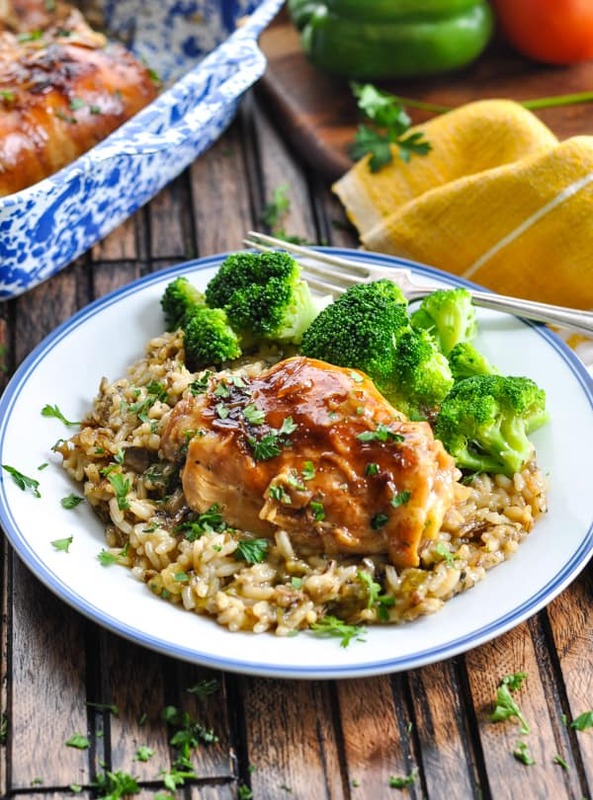 Cover tightly with foil and bake for at least 90 minutes (or up to 2 hours), until rice is tender and chicken reaches an internal temperature of 165 degrees F. The total cooking time will depend on the size of your chicken. I baked these extra large chicken breasts and thighs for the full 2 hours and they turned out perfectly. A meat thermometer is really the best way to tell when your chicken is done. When the rice is tender and the chicken is cooked through, fluff the rice with a fork and serve! 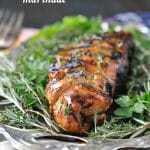 *I used 2 very large bone-in chicken breasts (about 1.5 lbs. each), as well as 2 bone-in chicken thighs (about ½ lb. each). You want the chicken meat to reach an internal temperature of 165 degrees F. That's how you know it's done! My meat thermometer is my best friend in the kitchen -- just make sure that the thermometer is not touching the chicken bone when you check the temp. I made the recipe and it was tasty. but soupy.n and not like a risotto. I have deduced that the culprit was the rice. Your directions call for a box of Uncle Ben;s long grain and wild rice with herbs. My supermarket seems to no longer carry the rice in that form. Uncle Ben’s rice products now come in pouches which seem to contain parboiled rice. Hence, the amount of liquid called for in the recipe was too much. I’m not sure how much liquid is now needed. I will make the recipe again in a couple of weeks and possibly omit the water. You might want to caution your readers about this situation. All I could find is Long Grain & Wild Rice fast cook instead of original recipe. Will this make a difference? 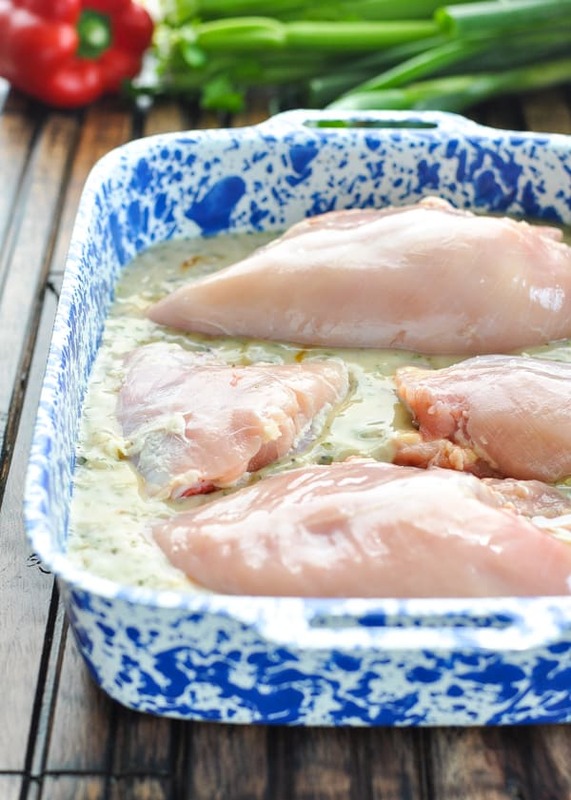 Hi there, can I use boneless, skinless chicken breasts? Just wondering if there is a reason that you only suggest bone-in chicken types. Hi, Margaret! Yes, you can, but I would choose some pretty large boneless breasts. I like the bone-in breasts for two reasons: (1) the bone adds a lot of flavor to the meat; and (2) the bone-in breasts have a longer cooking time than boneless meat, so they cook evenly with the rice. In other words, the chicken is done in the same amount of time as the rice. If you use boneless breasts, you’ll just want to make sure that they don’t get overcooked while you wait for the rice to finish and become tender. Hope that helps! I made this recipe this evening and it was excellent and so easy. My parents always come for Sunday dinner and my dad is a bit of a picky eater. He said this was a “home run”! I did use the fat free soups to lighten it up a bit and it was still delicious. Great recipe! I did use boneless skinless chicken breasts and it turned out very good. 90 minute cook time rice and chicken done. After dinner I cut the leftover chicken into bite-size pieces, mixed it with the leftover rice, and stirred in some steamed broccoli florets, for our lunches at work today!. This recipe is a keeper! Thank you Blair for all the easy and delicious recipes! Hi, Carolyn! 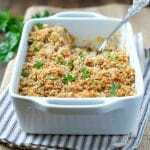 Since this recipes serves about 4-6 people, it will be a perfect recipe to double to serve 8-10. I would suggest preparing two separate 9 x 13-inch pans of the casserole. So basically, you’re just making the recipe twice. You’ll need 2 boxes of the rice, 2 cans of cream of mushroom soup, 2 cans of cream of celery soup, etc…(doubling all ingredients). Then just assemble the dishes as instructed and bake side-by-side in a 350-degree oven. Enjoy! 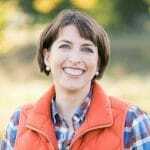 Thank you – appreciate your response. Will do it all in one large pyrex dish.